During the glory days of the Silver Dollar, David Owen was a young country blues player just in from Ottawa firmly in the John Hammond tradition, opening for visiting acts. He subsequently left public performance to work for the blues community in another way: his postering company, Grassroots Advertising, has flourished. He also raised a family north of Toronto. He’s now ready to resume his career and shows that he’s a mature artist and a very capable songwriter. He’s brought along some invaluable assistance as well, with Jimmy Bowskill on various stringed things & harmony vocals, Alec Fraser on his percussive brush bass and behind the glass, producer Gary Kendall. The ten-song program is all original, with many, well-incorporated borrowings from the blues & roots tradition. “Highway Driver” is a very good opener, a toe-tapper of a road song with Bowskill on mandolin. There are several songs that are strikingly original including the title song, a well-written tale of the realization that this lifestyle isn’t sustainable. “Every Piece of My Heart” has a gorgeous melody to go along with a lovely lyric and Bowskill on violin, a touch of genius. There’s a country feel to this one and “The Truth” is a full out country song with Bowskill on pedal steel. “My Sweet Rider” adds electric guitar to the mix and concludes the disc with some of Owen’s most impassioned singing. It’s an excellent conclusion to a mostly acoustic, very enjoyable disc. David Owen is back and one can only hope there are more discs to come. You can celebrate his return and pick up the disc at the CD Release Party at the Jazz Bistro on Oct 14, a TBS Hump Wednesday exclusive. 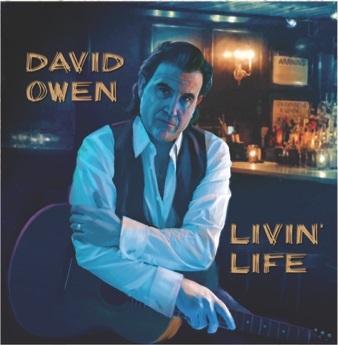 You can sample the music at Soundcloud, CD Baby & iTunes and his web site is www.davidowen.ca.